Director Dinah Madelin says: “Carolann has become one of our most hard-working, loyal and dependable carers, coming to us with no previous ‘care’ experience and convinced she would never be able to cope. However, nothing could be further from the truth as she has shown herself to be a real asset to our hard-working care team. 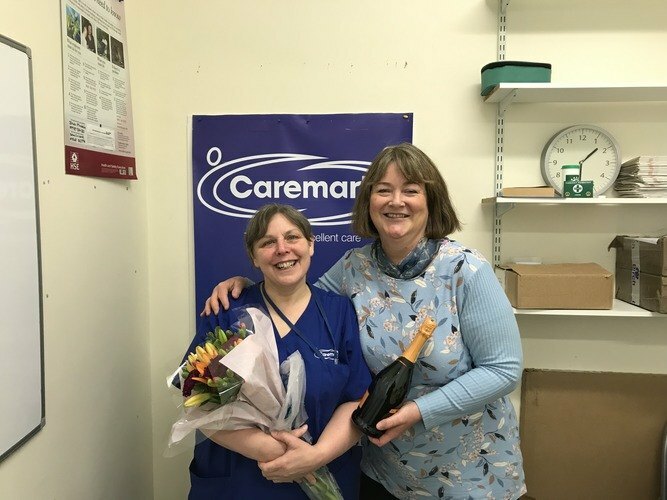 “She completed our very first induction training on the 29th May 2010 and nearly 9 years later she is still an important part of our team and a truly valued member of staff,” Dinah concluded. Carolann’s standard of work is exemplary with excellent written and oral communication and a level of commitment and dedication which is commendable. Although she does not drive, this has never affected her reliability and she still complete all calls on foot to her clients who live largely across a rural town. A prime example of her commitment and dedication was during some of the worst winter weather early on in 2018, when snow and freezing temperatures affected many areas of the UK, with rural areas suffering badly. Carolann walked miles through heavy snow to get to her clients, making sure everyone had their visit. An exhausting venture to say the least, but such is her commitment to Caremark and her clients. Dinah continues: “She is also really dependable, especially in difficult situations and does all she can to help out when other staff go off at short notice, which again demonstrates her conscientious approach to her work and her clients. “She is a great team player and very discreet, never getting embroiled in gossip, but works happily and respectfully with her colleagues. She has acquired a lot of respect over the years from clients and her colleagues,” she said.